While busy at this time of year restocking and going to events, I have managed to complete some of the commissioned work and have sent a couple off to their new homes. The watercolour above went to live in NSW yesterday. I have previously done a “Fly Fishing Tasmania” in a landscape format and reproduced it on fridge magnets. The challenge for this commission was to create a similar feel in a portrait format, making sure to capture the sense of light. This encaustic pendant, inspired by the skies of Aurora Australis, will be off to USA to match the bangle bought by a lovely lady visiting Hobart on a cruise. I also need to do a silk bracelet for her to match a pendant she bought. I have done 3 paintings for it but none are quite a close enough match so I will work on that again today. At the craft Fair I had some small matted watercolours of my “Ladies Day Out” loose style figures. These are based on Robert Wade’s “Bob’s Blobs” which I so loved when I attended a watercolour workshop with him years ago. I really enjoy doing these and the instructions for this were…… 3 friends dressed in red, yellow and purple. I did 3 works (all have been collected…. this was a practise), so the “three amigos” will each have one. What a lovely idea for an original Christmas gift for special friends. This is a little collection of current works based on my visits to the magnificent Tarkine area of West Coast Tasmania. A silk scarf, “forest greens” with a handpainted silk brooch using a solar technique. 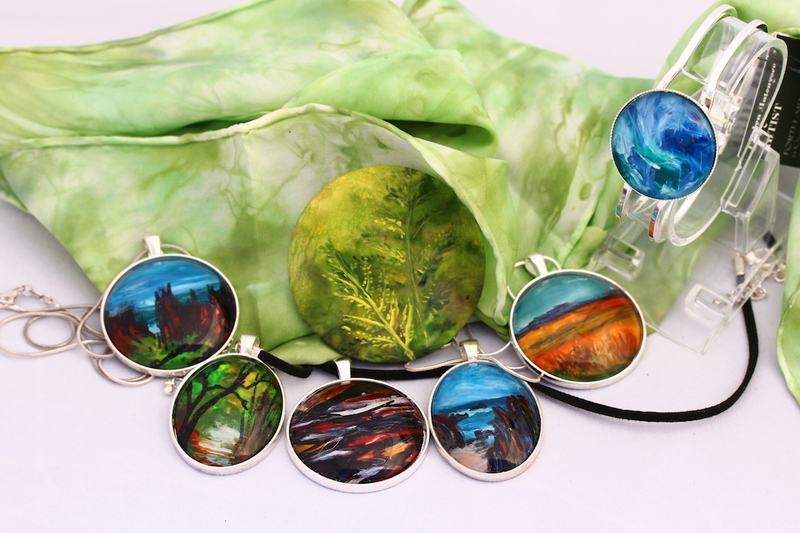 The others are pendants and a bracelet each containing a miniature encaustic painting. Inspiration (from top left)….. Sarah Ann Rocks, rainforest stream, logs at Arthur R mouth, Nelson Bay, button grass plains, the ocean (bracelet}.